« Show Some Support for Streetsblog Tonight! 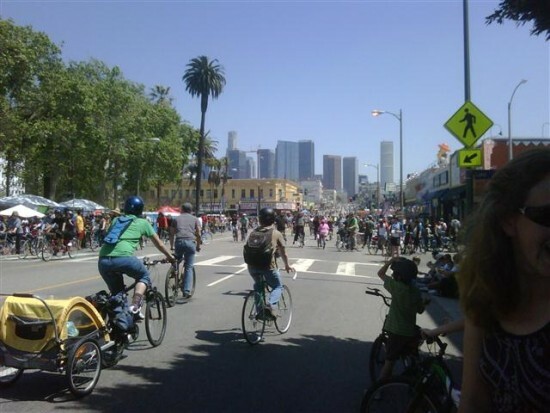 It’s hard to believe that an entire six months had passed since the inaugural CicLAvia open streets event, but the first of three in 2011 had arrived on Sunday. Like the first one, it again used the 7.5-mile route from East Hollywood to Boyle Heights, but this time, there were at least 50% more people taking part. CicLAvia on 7th street from the northbound 110 freeway, 12 noon. I finally got down to Hel-Mel at about 1 p.m. and despite having my bike stolen a couple months ago, my friend Lorna was generous enough to lend me her unused spare road bike (with an option to buy), so I got to ride that one. 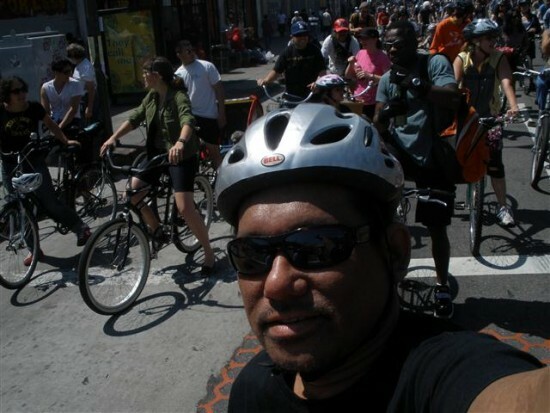 This time around, though I captured the day with digital still and video cams, I wasn’t intending to make a full-on documentary like I did for the first CicLAvia (it was the first one, anyway). With really only two hours to enjoy the event, I just wanted to be there. Mayor Villaraigosa, having lunch at Bottega Louie. CicLAvia had a lot of great coverage in the local news, though the reporter’s and anchor’s inconsistencies in pronouncing “CicLAvia” and deeming it the “second annual” event (even though the last one was half a year ago and the next one comes in 90 days) were a bit unsettling. Hopefully, people will get it right eventually. 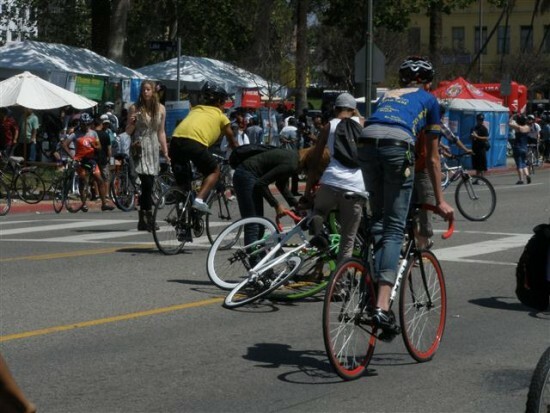 – Pronounce ‘CicLAvia’ Correctly: Whether it’s participants, news reporters or anchors covering the event, most people get it wrong. It’s not “sick-clavia” nor “sick-clay-via” nor “sick-la-gadda-davida.” It’s “SEEK-la-VEE-a.” Or as I like to say, “SEEK LOVE, YEAH!” The capitalized “LA” is not for verbal emphasis, but for literal emphasis — this is the L.A. version of Bogota, Colombia’s Ciclovia. – Five Hours is Not Enough: Not necessarily in length, but duration. This time around, with only two hours to enjoy the route, I tried to rush myself getting from East Hollywood to Boyle Heights and back. But then I realized that CicLAvia much more than just the bike ride. It’s running into your friends and having a nice chat. It’s stopping to give people assistance or directions. It’s chilling at the park to listen to the drum circle. It’s pausing to take pictures. It’s so many things. The route’s organizers want to expand the route eventually, but even at 7.5 miles, five hours isn’t enough. Or maybe it’s just a ploy to get us wanting more…How about 8 a.m. to 6 p.m. (during Daylight Savings Time)? That’s ten whole hours of CicLAvia bliss! I so want to play music alongside the route, but I also want to ride, and even try walking it sometime. A ten-hour CicLAvia would allow me to do all that. 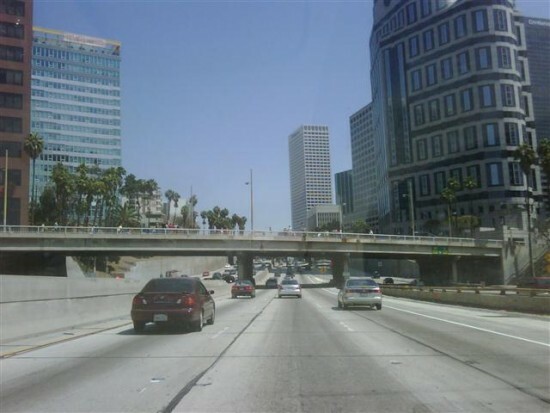 – Stupid L.A. Traffic: There are simply too many bicyclists! Argh! Just kidding. 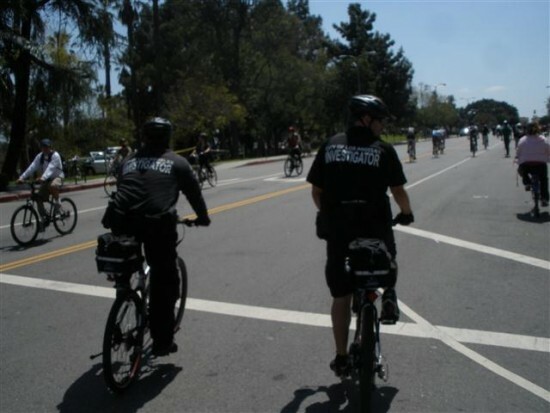 But future CicLAvias might want to explore various methods of traffic management, especially if the number of participants rises exponentially. – More Activity Centers: There should be more official (and unofficial) activity areas than just Hel-Mel, MacArthur Park, City Hall and Hollenbeck Park to serve as an attraction/diversion to get people off the course (see the traffic one above). I would vote for one in Koreatown (Shatto Park?) and another around the financial district in Downtown (Flower Street between 7th and 8th streets — it’s a one-way street going south, so that whole block would be devoid of cars anyway). – Pedestrian Lane: Perhaps create an informal “pedestrian lane” on the far right, so walkers, joggers and runners can enjoy their space. 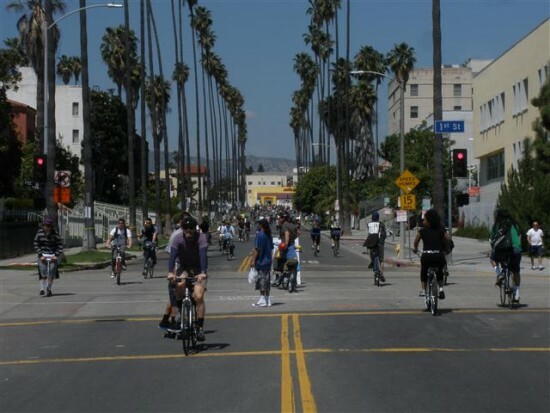 As the saying goes, “Freedom (from cars) Isn’t Free.” CicLAvia needs support to keep going, and to keep growing! This is really what it's all about. 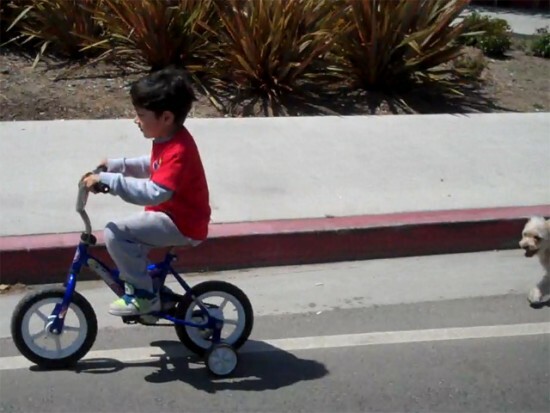 CicLAvia is many things to many people, but the biggest thing that makes me smile is the sight of parents walking or biking in the middle of the street alongside their smiling young children in small bikes with training wheels. 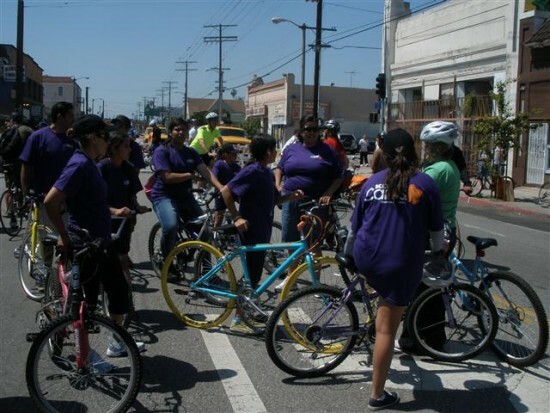 For the parents, CicLAvia is a special event, but for the kids, when they grow up, it’ll simply be another part of their weekend. 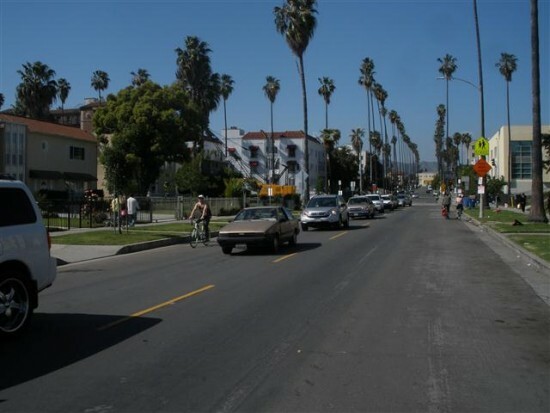 My favorite CicLAvia sight - palmtree-lined New Hampshire Avenue in Koreatown. A team of Kohl's employees at Hel-Mel gets ready to ride. Oops. A few crashes, like this one on 7th St in MacArthur Park, happened along the way, none serious. Bunch of folks draw chalk art in Hollenbeck Park.